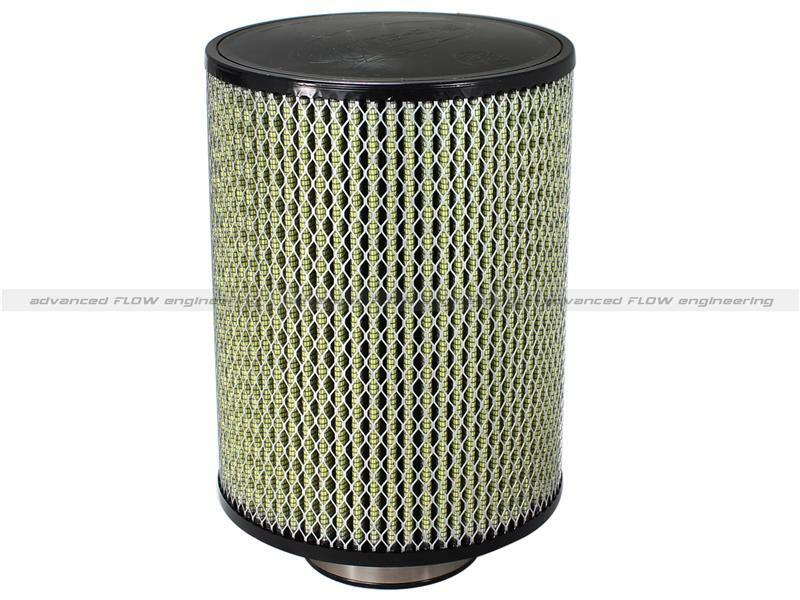 aFe MagnumFLOW Universal Clamp-On Filter UNIVERSAL - Lightning Motorsports - Selling Speed since 1996 ! Flg. ID-2in x B-3in x T-3in x H-6 in. Flg. ID-3.5in x B-5in x T-3.5in x H-6 in. 4 F x 8-1/2 B x 8-1/2 T x 11 H in. Flg. ID-4in x B-8.5in x T-8.5in x H-11 in. ID-2.75in x B-4in x T-4in x H-7 in. 3 F x 6 B x 4-3/4 T x 5 H in. 3-1/2 F x 6 B x 4-3/4 T x 9 H in. 4 F x 6 B x 4 T x 6 H in. Flg. ID-2.5in x B-6in x T-4.75in x H-5 in. Flg. ID-2.5in x B-5in x T-3.5in x H-5 in. Flg. ID-2.5in x B-5in x T-3.5in x H-9 in. Flg. ID-2 7/8in x B-5in x T-3.5in x H-5 in. Flg. ID-3in x B-5in x T-3.5in x H-6 in. Flg. ID-3in x B-5in x T-3.5in x H-12 in. Flg. ID-3.5in x B-6in x T-4in x H-6 in. Flg. ID-3.5in x B-5in x T-3.5in x H-8 in. Flg. ID-4.5in x B-7in x T-4.75in x H-4 in. Flg. ID-5in x B-6.5in x T-4.75in x H-6 in. Flg. ID-5in x B-6.5in x T-4.75in x H-8 in. Flg. ID-5.5in x B-7in x T-4.75in x H-6 in. Flg. ID-5.5in x B-7in x T-4.75in x H-8 in. Flg. ID-3.5in x B-6in x T-4.75in x H-9 in. Flg. ID-6in x B-7.5in x T-5.5in x H-12 in. Flg. ID-3.85in x B-8in x T-7in x H-8 in. Flg. ID-4in x B-7in x T-7in x H-6 in. 4in F x 6in B (INV) x 4-1/2in (INV) T x 8-1/2 H in. Flg. ID-2in x B-3in x T-3in x H-4 in. Flg. ID-2.5in x B-5in x T-3.5in x H-8 in. Flg. ID-2.5in x B-5in x T-3.5in x H-10 in. Flg. ID-2.75in x B-6in x T-4.75in x H-6 in. Flg. ID-3in x B-6in x T-4.75in x H-5 in. Flg. ID-3.5in x B-5in x T-3.5in x H-10 in. Flg. ID-4in x B-6in x T-4in x H-6 in. Flg. ID-4in x B-6in x T-4.75in x H-12 in. Flg. ID-4.5in x B-7in x T-4.75in x H-6 in. Flg. ID-4.5in x B-7in x T-4.75in x H-8 in. Flg. ID-4.5in x B-6in x T-4.75in x H-10 in. Flg. ID-6in x B-7.5in x T-5.5in x H-7 in. Flg. ID-4.5in x B-7in x T-4.5in x H-7 in. Flg. ID-5.5in x B-8.75in x T-6.5in x H-14.75 in. 4-1/2 F x 6 B x 4-3/4 T x 5 H in. 3-1/2in F x 6in B x 4-1/2in T (INV) x 6 H in. Flg. ID-2in x B-3in x T-3in x H-7 in. Flg. ID-2.25in x B-6in x T-4.75in x H-6 in. Flg. ID-2 7/16in x B-4 3/8in x T-4 3/8in x H-7 in. Flg. ID-2.5in x B-5in x T-3.5in x H-6 in. Flg. ID-3in x B-5in x T-3.5in x H-8 in. Flg. ID-3in x B-5in x T-3.5in x H-10 in. Flg. ID-3.5in x B-6in x T-4in x H-5 in. Flg. ID-3.5in x B-6in x T-4.75in x H-5 in. Flg. ID-4.5in x B-7in x T-4.75in x H-5 in. Flg. ID-4.5in x B-6in x T-4.75in x H-9 in. Flg. ID-5in x B-6.5in x T-4.75in x H-10 in. Flg. ID-6in x B-7.5in x T-5.5in x H-14 in. Flg. ID-3in x B-6in x T-5.5in x H-5 in. Flg. ID-5.5in x B-7in x T-6.75in x H-8 in. 5 F x 6-1/2 B x 4-3/4 T x 6 H in. 4 F x 8 B x 7 T x 8 H in. 5-1/2 F x 7 B x 4-3/4 T x 4-1/2 H in. Flg. ID-2.5in x B-6in x T-4.75in x H-7 in. Flg. ID-2.5in x B-5in x T-3.5in x H-4 in. Flg. ID-3in x B-6in x T-4.75in x H-8 in. Flg. ID-3in x B-6in x T-4.75in x H-12 in. Flg. ID-3.5in x B-6in x T-4in x H-7 in. Flg. ID-3.5in x B-6in x T-4.75in x H-7 in. Flg. ID-3.5in x B-6in x T-4in x H-9 in. Flg. ID-3.75in x B-6in x T-4.75in x H-6 in. Flg. ID-4in x B-6in x T-4.75in x H-5 in. Flg. ID-4in x B-6in x T-4.75in x H-10 in. Flg. ID-4in x B-6in x T-4.75in x H-14 in. Flg. ID-4.5in x B-7in x T-4.75in x H-12 in. Flg. ID-5in x B-6.5in x T-4.75in x H-7 in. Flg. ID-5in x B-6.5in x T-4.75in x H-18 in. Flg. ID-5.5in x B-7in x T-4.75in x H-7 in. Flg. ID-3.5in x B-8in x T-5.5in x H-8 in. 3 F x 6 B x 4-3/4 T x 9 H in. 3-1/2 F x (11 x 6) B x (9-1/2 x 4-1/2) T x 5 H in. 4 F x 7 B x 7 T x 6 H in. 4 F x 8-1/2 B x 8-1/2 T x 8-1/2 H in. 4 F x 6 B x 3-1/2 T w/ 1/4-20 Stud x 12 H in. Flg. ID-2 7/16in x B-4 3/8in x T-4 3/8in x H-6 in. Flg. ID-2.5in x B-6in x T-4.75in x H-6 in. Flg. ID-2.5in x B-5in x T-3.5in x H-7 in. Flg. ID-2 7/8in x B-5in x T-3.5in x H-6 in. Flg. ID-3 5/16in x B-5in x T-3.5in x H-6 in. Flg. ID-4in x B-6in x T-4.75in x H-6 in. Flg. ID-4in x B-6in x T-4.75in x H-8 in. Flg. ID-4in x B-6in x T-4in x H-8 in. Flg. ID-4.5in x B-6in x T-4.75in x H-4 in. Flg. ID-5in x B-6.5in x T-4.75in x H-9 in. Flg. ID-5in x B-6.5in x T-4.75in x H-12 in. Flg. ID-6in x B-7.5in x T-5.5in x H-9 in. Flg. ID-6in x B-7.5in x T-5.5in x H-24 in. Flg. ID-2.75in x B-6in x T-5.5in x H-5 in. Flg. ID-4in x B-6in x T-4.5in x H-6 in. 3-1/2 F x 6 B x 4 T x 5 H in. 5 F x 7 B (INV) x 5.5 T (INV) x 8 H in. Flg. ID-2in x B-3in x T-3in x H-5 in. Flg. ID-2.25in x B-6in x T-4.75in x H-5 in. Flg. ID-3in x B-6in x T-4.75in x H-6 in. Flg. ID-3 5/16in x B-5in x T-3.5in x H-4 in. Flg. ID-3.5in x B-5in x T-3.5in x H-9 in. Flg. ID-4.5in x B-7in x T-4.75in x H-9 in. Flg. ID-5in x B-6.5in x T-4.75in x H-5 in. Flg. ID-6in x B-7.5in x T-5.5in x H-6 in. Flg. ID-4in x B-6in x T-4.5in x H-9 in. 2-3/4 F x 6 B x 2-3/4 T x 5 H in x 3 fl. 3-1/4 F x (9x6-1/2) B x (6-3/4x5-1/2) T x 5-3/8 H in. Flg. ID-2 7/16in x B-4 3/8in x T-4 3/8in x H-5 in. Flg. ID-2 7/8in x B-5in x T-3.5in x H-7 in. Flg. ID-3in x B-6in x T-4.75in x H-9 in. Flg. ID-3in x B-5in x T-3.5in x H-7 in. Flg. ID-3.5in x B-6in x T-4.75in x H-8 in. Flg. ID-3.5in x B-5in x T-3.5in x H-5 in. Flg. ID-4in x B-6in x T-4in x H-10 in. Flg. ID-5.5in x B-7in x T-4.75in x H-10 in. Flg. ID-6in x B-7.5in x T-5.5in x H-8 in. Flg. ID-2.5in x B-6in x T-5.5in x H-5 in. Flg. ID- 4in x B-6in x T-3.5in w/0.25-20 Stud x H-12 in. (7 X 3) F x (8-1/4 X 4-1/4) B x (9-1/4 X 5-1/4)T x 5 H in. 3-1/2in F x 6in B (INV) x 5-1/2in T (INV) x 7-1/2 H in. Flg. ID-2.25in x B-6in x T-4.75in x H-7 in. Flg. ID-2 7/16in x B-4 3/8in x T-4 3/8in x H-4 in. Flg. ID-3in x B-6in x T-4.75in x H-14 in. Flg. ID-3in x B-5in x T-3.5in x H-9 in. Flg. ID-3 5/16in x B-5in x T-3.5in x H-5 in. Flg. ID-3.5in x B-5in x T-3.5in x H-12 in. Flg. ID-3.75in x B-6in x T-4.75in x H-7 in. Flg. ID-4in x B-6in x T-4in x H-9 in. Flg. ID-4in x B-6in x T-4in x H-12 in. Flg. ID-4.5in x B-6in x T-4.75in x H-6 in. Flg. ID-4.5in x B-6in x T-4.75in x H-8 in. Flg. ID-5.5in x B-7in x T-4.75in x H-9 in. Flg. ID-5.5in x B-7in x T-4.75in x H-12 in. Flg. ID-6in x B-7.5in x T-5.5in x H-10 in. Flg. ID-4in x B-8in x T-7in x H-8 in. Flg. ID-4.5in x B 8.5in x T-7in x H-12 in. Flg. ID- 3in x B-5in x T-4.75in x H-7 in. 3 F x 5 B x 3-1/2 T x 7 H in. (11-13/32 x 4) F x (14x5-1/2) B x (12x3-1/2) T x 5 H in. 3in F (offset 3/4 in.) x 6in B x 4-3/4in T x 6in H.
With 8-1/2” Base x 8-1/2” Top (Inv) x 11” Height with a 4” flange, this filter is a direct replacement for the popular Donaldson paper filter P/N: ECB085011). Rather than throwing the filter away, you can now wash the filter and reuse it over and over again. 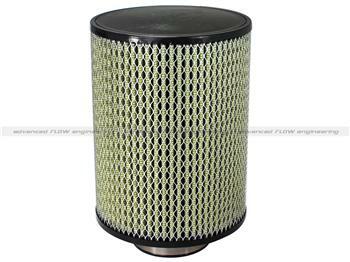 aFe performance air filters use a rounded, evenly spaced pleat design which produces more useable filter surface area for increased flow and greater dust holding capacity. Pleats are 30% taller that the paper alternative. To allow multiple cleaning cycles, the top and base are made of 100% pliable polyurethane that does not deteriorate with time or exposure to heat and chemicals. aFe Power Universal Clamp-on performance filters have a limited 2-year warranty.